What Does Beach Monkey Do? I’m so glad you asked. We are a full-service travel agency that has one goal: customer satisfaction. We will find you a great deal and help you create the perfect getaway. Here are just a few services we provide. We have first-hand knowledge of destinations. We know the ins and outs to be able to share with our clients. We have the scoop. Have you ever seen a bad destination picture online? Of course you havent. That would be bad marketing. Because of our extensive travel experience we have first hand knowledge of the destinations. The only boundaries that exist are the ones that you have for yourself. Our agents will work tirelessly with and for you to find you best vacation package possible. If you have a toothache would you try and remedy that yourself? No you would seek a professional. While today's technology can allow you to plan your own trip, working with an expert agent can get you access to the best deals and the inside knowledge to help make them a reality for you. 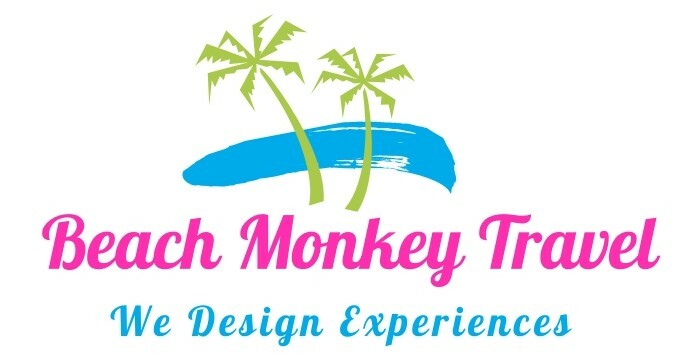 Beach Monkey Travel uses firsthand knowledge, expertise, and connections to help cut through the clutter to create the best possible value and overall vacation experience for you. Our advisors can get you exclusive access to events, private tours, and other extras. We can also secure unique amenities that make you feel like a VIP. Why purchase a "one size fits all" trip when you could have a custom experience? When you collaborate with a travel agent, your trips will be tailored to your needs, interests, and budget. Our advisors have traveled extensively and are experts in the art of travel. They truly understand each destination and can give you the advice and little details that only come with experience. Beach Monkey Travel has relationships with people around the world who can arrange unique experiences that make a trip truly extraordinary. Our travel agents have access to the same (and often better) pricing that you can find online, and can secure special perks you can't get yourself. Our services are always free. In addition to saving you time and money, your advisor is available 24/7 before, during, and after your trip. So if a crisis does occur, we can handle it while you relax and have fun.